Since the Second World War, American comics have consistently played a role in America's conflicts. In one of the famous images from the golden age of comics, Jack Kirby's red, white, and blue-clad Captain America was shown delivering a powerful blow across Hitler's exaggerated nose amidst a host of desperate Nazis. Serving in the U.S. military during that era, Spirit creator Will Eisner turned to illustrating Army manuals such as Army Motors and Preventive Maintenance Monthly. Shortly after 9/11, the major comics companies, based in New York from their earliest days, developed a range of benefit projects and dramatic interpretations that made comics the first medium to grapple with depicting the subject creatively. 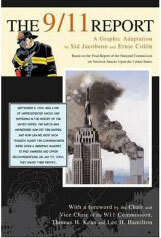 In The 9/11 Report: A Graphic Adaptation, Jacobson and Col=n, two veterans of the early days of comics, have distilled each of the original report's thirteen chapters into roughly eight pages of illustrated panels including text drawn from the report, as well as some expository dialogue in word balloons. In essence, the book is not a dramatic interpretation, and generally aims to impart information rather than provoke the imagination. Some of the most efficient sequences in the book are the four-way timelines of the hijacked flights from takeoff to destruction, and the visual synopsis indicating the relationships between various branches of U.S. intelligence and law enforcement. Where the illustrated narrative falters is when the story calls for speculation because the artists tend to take what must be conscious recourse to caricature. There's a panel in the eighth chapter, "The System Was Blinking Red", in which Col=n depicts a U.S. agent receiving a tip from an informant in a restaurant. In an image more suggestive of newspaper funnies than of contemporary graphic novels, the agent pretends to read a newspaper while a large Arab eating an enormous piece of cake leans over conspiratorially. In the background a distinctly French-looking waiter daintily carries some wine glasses. It's exactly the type of interpretation that invites outsiders to balk at the medium.